Dan asked if I would start a thread on the Insta360 Pro VR camera further to receiving delivery a few weeks ago. I will add to this once I have finalised the process of testing the camera....getting in front of patient clients at the moment is challenging due to the busy summer holiday period in Europe. To date I have just been testing the Insta 360 Pro camera in several different environments (night-time / low light, daytime / sunlight, Real Estate indoors, busy crowds etc.) and still testing to find the sweet spots and trying to avoid the pitfalls e.g. blown out windows when filming indoors. There are ways around this (Isolated exposure sets exposure to each of the 6 individual lenses & shoot in flat mode and colour in post production) but it's not easy. The community is linked to Insta's development team and they are on the ball. For example I requested adding white balance to the iPhone e App for manual exposure and within 10-days it was added to an update and new camera firmware. These guys are definitely committed and work 16-hour days including weekends. This takes a lot of time to upload unless you have a high speed fibre connection which is limited where I live. When you upload content to FB or Vimeo etc. 4K Video starts to look like 720 - 1080 Video in terms of resolution once it's compressed - it's best to view in a small window to appreciate the footage. To get an idea of normal resolution, view in Safari or other non 360 browsers as it will show it as a flat file i.e. non 360 view. Of course you can play in higher resolution on your desktop / laptop but you need to use a local player; Insta's own Free Player or GoPro's Player etc. So you can only provide files to someone for local use offline with an understanding that they will need to download a player and store the files on a local drive or iTunes etc. If anyone is looking to get into this professionally, be aware that the camera maybe $3,500 + local import duties & shipping, but also be prepared that you will need a realstic budget of approx. $10,000 if you want to do this professionally. Why? - This is an industry challenge due to legacy Telephone / Internet networks and low specs in terms of consumer computing power & 4K VR Ready Graphics Cards etc. 1a. The Insta360 Pro can stitch in 4K inside the camera - if you want to stitch in 8K, you need to save to the SD card and stitch post production on high spec computer; i7 Processor, GTX 1080 Graphics Card (supports 4K Video & VR) & at least 16GB - ~$3,000. 1b. Same with editing - will require high spec computer to edit 4K & 8K video. To put this in perspective Apple currently has nothing available that can handle this. Only the Mac Pro which is due to be released in December 17 starting at $5k. The current highest spec made to order new iMac 27 is only available with a Radeon 580 Graphics card which has mixed reviews for 4K VR. Would you spend $3,500 on a 27" Mac that may not work in a few months time as the industry rapidly evolves? 1c. If you want to do this on a laptop, then these specs are typically Gaming Laptops for around $4k. There is talk of the Insta software being able to stitch 8K in camera post production, however this is not currently available. The alternative is to outsource the editing process until you get a feel for demand for your content. 2. For Pro use you will require additional software e.g. Autopano Pro + optional Adobe Editing Tools etc. $300 - $1,000. Insta Pro can shoot HDR, Timelapse etc. however you will need software to edit. 3. The camera has in camera stabilisation, however this only works in certain situations. Therefore you will need a handheld gimbal if you plan to move / walk around around - $600 + import duties & shipping - Gudsen Air 360. 4. If you're thinking Real Estate etc. and don't want to film the operator you will need to be creative and invest in an Radio Control Robot - look on previous threads for RC robots, however the current offerings are limited beta type products that are on the market are for around $3k. 5. Same with Drone - the camera is 1.3KG - even the Inspire 2 will not handle this payload. The Insta 360 Pro is a very good camera with lots of potential, however be prepared to invest in additional equipment and a learning curve especially if you are not from a photography / videography background with basic editing skills. This will be the same for any Pro 360 camera. Initially think Events where you want to film 360 with moving people / objects. As the accessories evolve and come down in terms of cost and increase in choice, then Aerial / Drone, 2 min Real Estate Tours (without showing the operator) etc. will become more attractive propositions. I have also summarised what you can expect to get out of the Camera based on different skill levels & experience. For some of us, it maybe more appropriate to outsource the advanced areas to a skilled 360 video editor whilst learning the techniques. Ease of use and different level of skills required to operate the Insta360 Pro. The camera can be controlled by an iPhone App, Laptop App or buttons on the actual camera. - Preview on App, download and play on Laptop etc. with Insta Pro Player or GoPro Player etc. or upload from SD card directly to FB & other 360 Players. - Create 8K Video and stitch in 3rd party software e.g. Autopano etc. and change colour profiles etc. These areas will require more advanced video editing skills in post production to overcome issues such as blown windows when filming indoors etc. I personally have not noticed GPS functionality on the Insta Pro - then again I have not been looking for it. 2. As a pro user, request access to the Insta Pro feedback group and raise a direct request to the development team - maybe this is in the pipeline via a software update or GPS plugin adapter kit - the Insta Pro has several ports including USB C.
This is a closed group so likely you will have to provide a serial number or proof purchase to gain access. In the meantime I'll raise this question on the feedback group and let you know if I get an answer. I've also raised the question on whether this module can be retro fitted to existing cameras. 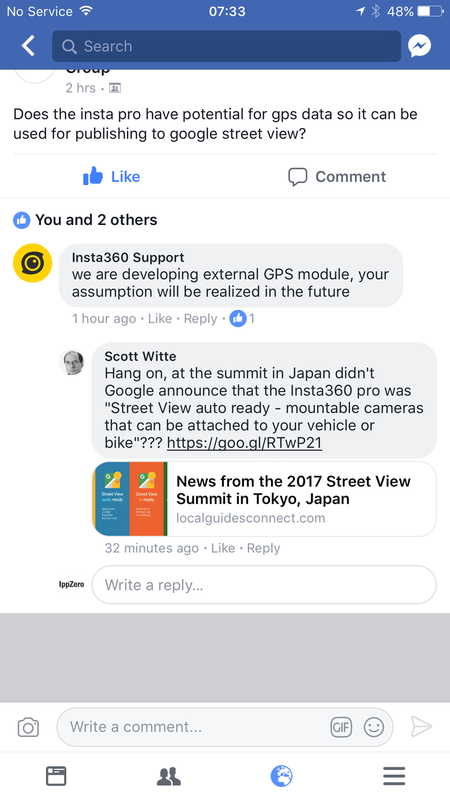 Thanks for confirming - so will this likely be a plugin adapter - I assume that the existing Pro camera does not have GPS hardware preinstalled? We have just purchased this camera and awaiting delivery! Thanks for your insights! Please do share your thoughts about the Insta360 Pro ... once you have had a chance to play with it. Perhaps we should do a WGAN-TV Live video chat - in about a month or two - with those that have bought this Camera? I had a conference call with a prominent east coast company that creates 360/vr content for the entertainment industry. They have produced football and basketball games, commercials and lots more. They desire to be the largest producer of online video series. I spoke with the creative director and he suggested the Insta Pro. The question I forgot to ask him....what do they use? His company is creating Emmy awarding winning stuff for Disney, NBC, ABC,ESPN, Intel, YouTube and more. He had never heard of Matterport. I promised to provide some footage taken from the Insta360 Pro. This has been challenging due to the European peak holiday season i.e. most venues are full and businesses don't have time or patience, therefore the 360˚ pano images were taken when there were no clients i.e. sunset. Download the FREE GoPro Player to view 360˚ panos & 360˚ video. You can also download the FREE Insta360 Player which allows different views; fisheye, flat etc. - the GoPro VR player offers slightly better viewing quality. 1. Attached is file with a series of 360˚ panos taken using the in camera optical stitching. These are completely unedited, so in some cases you get to see the tripod base, stitching errors and over / under exposure....but this gives you a feel for the quality and challenges as there is no adjustable aperture and you cannot add ND filters. a. I have found that manual exposure works best in bright sunlight - drop the ISO to 100 and adjust the white balance manually and shutter speed manually to get to the right exposure. b. In twilight, use isolated exposure - this an auto exposure setting for each of the 6 lenses i.e. to help compensate for the dynamic range; dark and light areas, however as the light darkens, you start to see the stitching lines....examples in the files. At this stage better to move back to Auto exposure. c. Dark scenes - just after sunset again move to Auto. and note that once you get to ISO 6400 in dark environments the quality is very grainy and typically unusable. d. For the more advanced users, it is possible to shoot in Raw and also HDR. 2. Attached is 1 min video which was taken in 8K. It combines 3 * 8K panos at sunset using In Camera Real Time Stitching and also 2* 8K Videos which were stitched using Optical Flow in Post Production. It was then rendered in 4K so that it will play on most current computers - note 8K video will not play on low to medium spec computers as you need a high end graphics card. 3. The camera also has a time-lapse function, although I have not yet tested this. I think one possible issue with time-lapse is that the exposure does not automatically adjust as the lighting changes e.g. trying to film at sunset. Regarding the comment on high end production companies. Likely any high end production company creating VR for broadcasting will be using the Nokia Ozo. This retails for around >$40k i.e. 10 times the price of the Insta360 Pro, however it does not offer tens times the quality or features. Unless you have some serious commitment & demand you would not take the risk on the technology given how rapidly 360˚ cameras are evolving. For most users on this Forum, the mid range Insta360 Pro will probably fit their needs with a few compromises here and there - this camera can also shoot in 3D stereo.